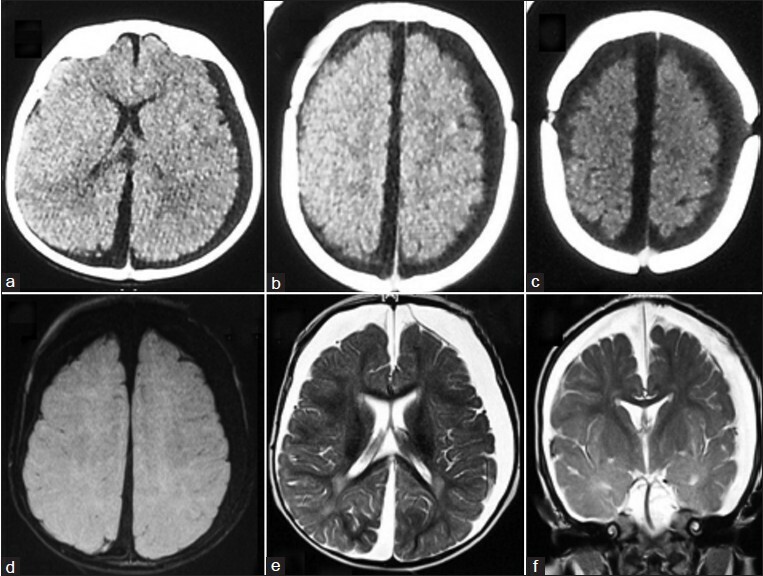 Subdural effusion (SDE) in an infant is a rare clinical scenario, which may be secondary to a variety of etiologies. Massive SDE is an extremely rare complication of head injury. It usually runs a self-limiting course. Though neurosurgical intervention is occasionally needed, different methods of surgical procedure for management includes burr-hole alone, burr-holes with subdural drain placement, twist drill craniotomy with drain and even craniotomy. The authors report a rare case of progressive massive SDE, which despite bilateral burr-hole placement and drainage failed and presented with visual deterioration and massive bulge of scalp at burr-hole sites producing rabbit ear sign in a 10 month old infant. Ultimately cystoperitoneal shunt was carried out in a desperate attempt to prevent impending rupture of scalp sutures at sites of previous burr-hole placement. Astonishingly not only complete resolution of hygroma, but visual recovery also took place. Patient is doing well at 6 months following shunt with regaining normal vision and appropriate developmental milestones. A magnetic resonance imaging scan of brain at last follow-up revealed mild ventriculomegaly with subduro-peritoneal shunt in situ and rest of brain was unremarkable. Such cases have not been reported in literature until date. Persistent accumulation of fluid in the subdural space may be either hygroma or hematoma. It is encountered commonly in infants, usually secondary to head injury; other causes are leptomeningeal infection, arachnoid cyst or post ventriculo-peritoneal shunt. ,, These collections evolve following acute onset hematoma or breach of the arachnoid usually precipitated by blunt force trauma, which may occur following accident or non-accidental origin. ,,, Subdural effusion (SDE) may show spontaneous resolution or enlarge with passage of time. It may clinically present with rapid enlargement of head size, focal symptoms caused by compression over adjoining brain parenchyma or in progressively enlarging condition can produce global neurological deficits. Raised and progressively worsening intracranial pressure in our case led to visual deterioration, tense fontanelle and progressive bulging of scalp due to ongoing accumulation of subgaleal collection with impending rupture of scalp wound at burr-hole site, which required subduro-peritoneal shunt. This 10-month-old male infant, presented at our neurosurgical emergency services with a history of depressed sensorium for 2 days. This followed a road traffic accident 10 days ago in which he was sitting at the rear seat of car and was the sole survivor. On physical examination, his pulse rate was 158/min and blood pressure 68/40 mm Hg. On neurological assessment at admission, he was arousable, moving limbs spontaneously with good cry. His anterior fontanelle was tense. Pupils were mid dilated and non-reacting to light. Hematological and biochemistry profiles were within the normal limits. Computerized tomography (CT) scan of the head done immediately after accident revealed presence of thin subdural hygroma in both frontoparietal regions with compression of adjacent brain [Figure 1]. Ophthalmologist evaluation for vision showed doubtful presence of vision. He was being managed with cerebral decongestant with regular visual assessment and monitoring under ophthalmologist. Repeat CT scan and magnetic resonance imaging (MRI) done after 10 days, following depression of sensorium revealed enlargement of bilateral SDE [Figure 2] and fundoscopy revealed presence of bilateral papilledema. Patient was shifted to operating room for emergency evacuation of SDE. Right parietal and left parietal burr-holes were placed with drainage of subdural hygroma; the fluid collection was xanthochromic and under raised pressure. The post-operative period was uneventful except rapid bulging of scalp wound at burr-hole site seen bilaterally. He was put on acetazolamide and furosemide with spironolactone for 2 weeks. Despite these, scalp swelling continued to increase rapidly on both burr-hole sites with impending rupture of wound at burr-hole site. The bulging of scalp mimicked bilateral 'rabbit ear' appearance [Figure 3]b. CT scan showed the presence of massive SDE causing mass effect [Figure 3]a. So he was again taken to operation theatre and under general anesthesia a right sided subduro-peritoneal shunt was carried out. Subdural fluid sample was sent for cytopathology, biochemistry and aerobic, anaerobic, fungal and mycobacterial tuberculosis culture. In the post-operative period, subduro-peritoneal shunt was working well with complete resolution of subdural fluid collection. He was discharged on fifth post-operative day following shunt surgery. At the last follow-up 6 months after surgery, he regained significant visual recovery and MRI carried out at follow-up showed a mild hydrocephalus with no residual subdural collection [Figure 3]c-d. He was regularly followed-up in pediatrics and the observed developmental milestones were corresponding to the child's age. Various treatment modalities have been advocated including fontanelle tapping, burr-hole craniotomy as a standalone procedure, burr-holes with placement of subdural drains, twist drill craniotomy with drain placement and formal craniotomy and have been extensively evaluated. ,, Fontanelle tapping can be used for every stage and rarely massive bleeding is encountered if small needle is utilized for punctures. Continuous external drainage involves a risk of infection. Implantation of an Ommaya reservoir and endoscopic observation along with burr hole irrigation are very useful methods of treatment for SDE. Miyake et al. discourages use of subduro-peritoneal shunt and it cannot be recommended for the treatment of SDE in most cases. Subdural shunts have an inherent long-term potential morbidity. Few cases may develop subarachnoid to subdural collection, which may be unrecognized and cause dependence on shunt. A second surgery may be required for its removal if it is not needed anymore. Klimo et al. advocates most desirable procedure would be one that has the greatest chance of definitively treating the SDE as a single surgery with low risk of complications and without placing a shunt. Contrary to this, in our case despite burr-hole placement and conservative treatment becoming ineffective, the patient developed progressive subdural hygroma under pressure with visual deterioration, which was managed successfully with placement of a subduro-peritoneal shunt. The authors recommend that subduro-peritoneal shunt still has a role in management of such cases especially associated with raised intracranial pressure and its sequelae (depression of sensorium and visual deterioration), which showed complete resolution of SDE as well as amelioration of raised pressure leading to functional recovery of vision. 1. Caldarelli M, Di Rocco C, Romani R. Surgical treatment of chronic subdural hygromas in infants and children. Acta Neurochir (Wien) 2002;144:581-8. 2. Hwang SK, Kim SL. 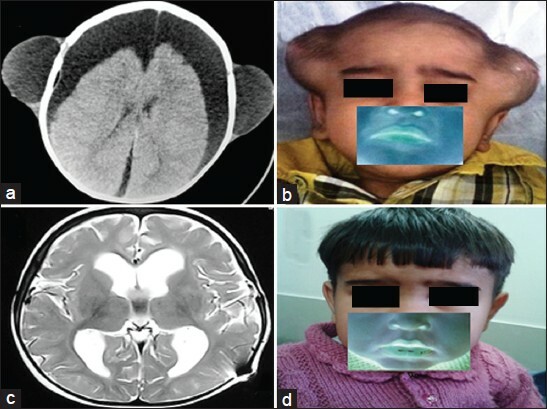 Infantile head injury, with special reference to the development of chronic subdural hematoma. Childs Nerv Syst 2000;16:590-4. 3. Vinchon M, Delestret I, DeFoort-Dhellemmes S, Desurmont M, Noulé N. Subdural hematoma in infants: Can it occur spontaneously? Data from a prospective series and critical review of the literature. Childs Nerv Syst 2010;26:1195-205. 4. Vinchon M, Joriot S, Jissendi-Tchofo P, Dhellemmes P. Postmeningitis subdural fluid collection in infants: Changing pattern and indications for surgery. J Neurosurg 2006;104:383-7. 5. Klimo P Jr, Matthews A, Lew SM, Zwienenberg-Lee M, Kaufman BA. Minicraniotomy versus burr holes for evacuation of chronic subdural collections in infants: A preliminary single-institution experience. J Neurosurg Pediatr 2011;8:423-9. 6. Miyake H, Kajimoto Y, Ohta T, Kuroiwa T. Managing subdural fluid collection in infants. Childs Nerv Syst 2002;18:500-4. 7. Abouzari M, Rashidi A, Zandi-Toghani M, Behzadi M, Asadollahi M. Chronic subdural hematoma outcome prediction using logistic regression and an artificial neural network. Neurosurg Rev 2009;32:479-84. 8. Kwon TH, Park YK, Lim DJ, Cho TH, Chung YG, Chung HS, et al. Chronic subdural hematoma: Evaluation of the clinical significance of postoperative drainage volume. J Neurosurg 2000;93:796-9. 9. Cenic A, Bhandari M, Reddy K. Management of chronic subdural hematoma: A national survey and literature review. Can J Neurol Sci 2005;32:501-6. 10. Lega BC, Danish SF, Malhotra NR, Sonnad SS, Stein SC. Choosing the best operation for chronic subdural hematoma: A decision analysis. J Neurosurg 2010;113:615-21. 11. Mondorf Y, Abu-Owaimer M, Gaab MR, Oertel JM. Chronic subdural hematoma - Craniotomy versus burr hole trepanation. Br J Neurosurg 2009;23:612-6.